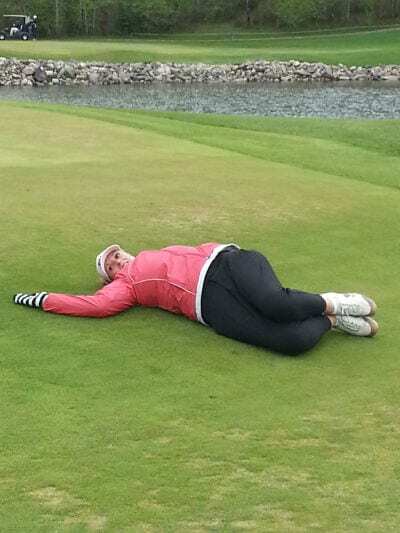 Even though a round of golf is meant to be a relaxing way to spend the afternoon, bad technique and overstraining can lead to painful injuries. A recent study has shown that within a two year period, 60% of golfing pros and 40% of amateurs experienced some kind of injury during a game – with most of those injuries resulting from overuse. Rotate to look over your shoulder on each side. You should be looking to see if you can rotate more on one side versus the other. This should quickly reveal any imbalances. The stretches we provide in this article will help you restore and maintain movement and balance along your spine. A useful golfing routine includes a pre-game warm up with 10 to 15 minutes of low-intensity activity and stretches that useyour large muscle groups. Start with a brisk walk, for example, and then move onto stretching the muscles frequently used in your swing: the back, shoulders, neck and hips. But don’t worry; we’ve put together a few of our favourite stretches. A full trunk side stretch is a great place to start as it works to stretch your shoulders, mid-back and the powerful latisimus muscles. Start by bringing your arms overhead and interlocking your fingers and reaching to the opposite side. Focus on keeping your weight on both feet. You can progress to using your club to help get a deeper stretch for each side. Hold for 10 to 20 seconds per side. Repeat 5x per side. Next, you’ll want to work on gently stretching your low back. The goal here is to improve your lumbar rotation. Lay on the ground with your arms to your side and bring your bent knees together. Slowly lower your knees to one side and then the other. There’s no need to force this stretch and remember to focus on a slow gradual movement. Repeat 15-20x per side. In standing you’ll want to finish with a standing rotation stretch. This will help to address you mid-back as well as improve your hip mobility. Keeping your feet planted, you’ll focus on rotating through your trunk and hips. Using a club over your shoulders can help to get a deeper stretch. Repeat 15-20x per side. 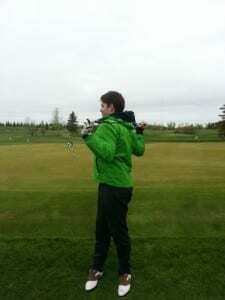 Next, try a few golf specific movements by slowly moving through a swing, back and forth. Balance each movement on each side of the body and then practice the swing with increasing speed. This set of stretches works really well to help with your cool down as well. Far and away the most common golfing injury is to the back – explosive and extensive rotation during a golf swing can really take its toll. Prevent these kinds of injuries by focusing on a full rotation of the lead hip as you finish your swing, keeping your range of motion as full as possible. Golfer’s elbow, or medial epicondylitis is also surprisingly common , and is caused by “fat” shots, or hitting the ground with the club. Tennis elbow, or lateral epicondylitis, is caused by over-swinging with the dominant hand. Poor swing mechanics can increase strain on the joints, and sadly may become more common with age or with increased frequency of play. 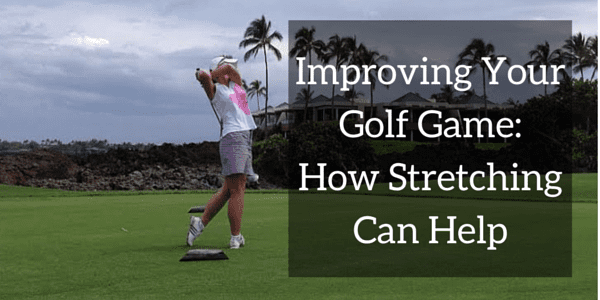 Luckily, this can be prevented by carefully stretching the upper body before a golfing session and taking time to strengthen the surrounding upper body muscles. Lastly, poor technique sometimes results in shoulder pain, and the subscapularis, pectoralis and latissimus muscles are the most affected during swings. 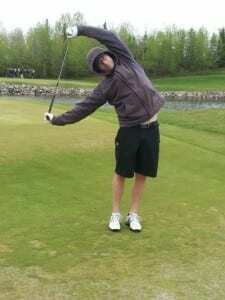 Golfers often have trouble with their lead arm and may suffer from shoulder impingement. To protect your shoulders, avoid prolonged carrying of heavy golf bags and stretch gently before and after each game. Pre-existing injury that seems to be aggravated. It’s best not to ignore these early signs of injury. Our physiotherapists can pinpoint problem areas and provide the needed treatment to get you playing again. And who knows we may even be able to help you improve your handicap!